Tragically, a tiger in Iowa was shot by authorities after it escaped and killed the owner’s dog. 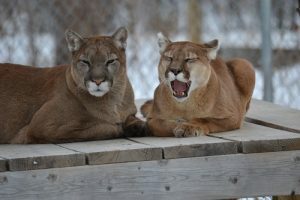 Once on property, they discovered the owner also had two cougars named Raja and Tasha. They quickly contacted TWS for help. Raja and Tasha came to TWS in 2007, a true sanctuary where they would get the care and space they needed. 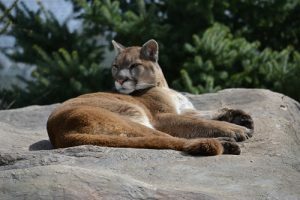 Despite Raja’s rough start in life, he’s a happy cougar who’s only social with the people he knows. He tends to retreat when other people are on site. But, once they pass, he’s back to playing with his toys and cuddling with his roommate Liberty. Liberty’s helped Raja come more out of his shell. She loves to yell at her caretakers for food, which has rubbed off on Raja. The only difference is, Raja’s a little quieter than his vocal partner. He loves hanging out on top of his platforms, watching his neighbors around him. He’s always up for any kind of food enrichment and is always the first to come up during meal times. Though out of all the enrichment caretakers have tried with him, nothing is better than tearing apart a piñata! You can help provide daily care for Raja by sponsoring him today. Raja would be so happy to have you as his sponsor parent! You can read a great story published by THE DODO about Raja and Liberty’s special friendship HERE.